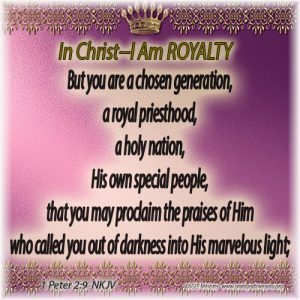 Believers, in Christ we are royalty! We are chosen, royal priests, of a holy nation. Special people, filled with the light of Christ, and what are we called to do? Proclaim the praises of Him who called us out of the darkness! Being royal is wonderful, but it also has a responsibility. We don’t just live for ourselves, we live now to do God’s good works on this earth. We are called by Him to fulfill the great commission of preaching the gospel to all we meet. We are called to be fruitful. We are a blessed people whom the world should see as different and that should cause them to want to learn more about why. Walk in your calling saints, and be blessed.